After making those first cake batter truffles, I went on the look out for more! I dare say I like this recipe for Cake Batter Truffles better than the last (maybe it’s the sprinkles!) Try them out and test them for yourselves! In a large bowl, beat together butter and sugar until well combined. Beat in vanilla. Add cake mix, flour, salt, and vanilla and mix thoroughly. Add in milk and mix to combine. If needed, add more to make a dough consistency. Stir in sprinkles. Roll dough into one inch balls and place on a parchment or wax paper lined cookie sheet. Chill balls in the refrigerator or freezer for 15 minutes to firm up. While dough balls are chilling, melt almond bark in the microwave in 30 second intervals until melted. Make sure to stir between intervals so that chocolate doesn't burn. Using a fork, or however you prefer to dip truffles, dip truffles into almond bark and shake of excess bark by tapping the bottom of the fork on the side of your bowl. Place truffle back on the cookie sheet and top with sprinkles. Repeat with remaining balls until finished. 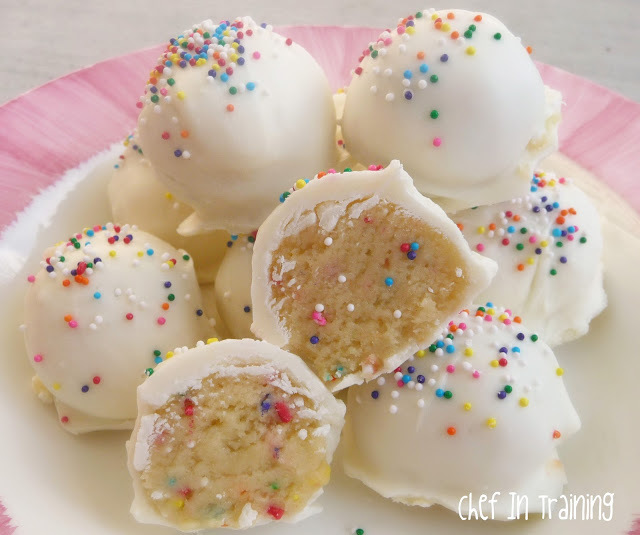 Chill and keep cake batter truffles in the refrigerator until serving in an air tight container. Store leftover truffles the same way. Makes around 24-30 truffles. Wow....i am so going to have to try these! Which 'flavor' do you like the best? I made these last weekend for a friends' b-day party, and people were dying over them. I was too-I don't know how I managed to make it to the party without having eaten all of them. I'd like to try again with a different cake flavor-maybe chocolate. I love this idea! I made no bake Oreo truffles that were so good, so I think I would LOVE these as well! Thanks for the recipe! these look really good and super easy! can't wait to try the recipe. thanks for sharing! I hope you didn't feed these to your children because they have sugar in them and that is REALLY bad for kids. PS these look absolutely delicious! Honey, sugar isn't bad for you. Any is bad for you if you eat too much. Water is bad for you if you have too much. Does that mean you don't give your children water? You can't compare sugar to water.. That makes no sense! I would love for you to show me research that says white sugar is harmful in small amounts... In excess, yep... As a dietician, I am well aware that there are other, better options. But I am also not familiar with any research that says what you claim. Giving inaccurate health information is NOT helpful to the advancement of healthier eating habits! Omg! This modern moms and there phobias to everything! I bet that when you were a kid, your mom fed you with all types of sugar and candies! And here you are! :) this recipe is a must try! :) looks delish! Thank you, that's exactly what I thought! We just live ones! Recipe sound great. Would like to try. Can I also use none cook pudding instead of the cake mix? I've made these and I don't recommend pudding mix instead. What makes them taste like "cake batter" truffles is the cake flour (and other flavorings) that are in the uncooked batter. Use cake mix and you'll be glad you did!! These are really cool!! Love this idea! Yummy!! Thanks for linking up! This is soooo tasty-looking! And, not as messy as mixing the icing and cooled cake together!!! Thanks for posting! I've pinned this one - had to have a way to remember where I saw it! I agree! I used to make cake pops cooking the cake and mixing frosting in... But these are just as tasty if not better AND less messy! These are beautiful! I like the idea of a no-bake filling. I'll definitely add these to my to-do list. I'd like to invite you to share your recipe on Sweet Indulgences Sunday. Great idea! First time I've heard of these! So glad you stopped by and shared the recipe at the Tuesday To Do Party! I can't believe these are no bake!! So gonna have to try! mmmm these look awesome! I can't wait to try them!!!! Nikki, first let me saw Wow! Next let me say yum! Then let me say...ok you get the idea. I made these this afternoon and they turned out great. I used the ingredients I had on hand which was the Halloween Funfetti Cake Mix, orange melts, chocolate melts and white melts and Halloween sprinkles. These are perfect for a little get together tomorrow. I can't believe how easy and yummy these are. Will be exploring with other flavors. Thanks so much for sharing such a fun idea. Sprinkles for everyone!!! I REALLY want to make these tonight, but I'm slightly confused...in the ingredents you listed Cake mix and Vanilla in the batter section...however in the baking section they were not listed? Cake mix is on the list 2x so i'm assuming the 1st time is part of the batter ball and the 2nd time is for the coating? But where/when do I add in vanilla?! @Lmonaco10 I am sorry for the confusion. I added in to blend in the vanilla after you cream the butter and sugar together. Yes there are two different amounts of cake mix. The second one is listed under the truffle coating. I hope that makes sense and that I was able to help. Let me know if you have any further questions! I'd love to help! Does it really call for 1 and a half cups of flour. My friend made them and thought that might be a mistake. She used 1/2 cup of flour. Which is right? A great recipe! I made these this weekend and ended up throwing them all in the trash. They were super sweet and normally nothing is too rich for me but these were over the top. My husband wouldn't try them but they were not pretty enough to give out. I had a few issues with the choc. and I had to do the choc. a second time. @Anonymous I am sorry these were too sweet for you. Here is a link to a cookie with the cake batter flavor and on this specific post are links to other cake batter flavored things you may want to try out instead. Thanks for your feedback! Any tips for getting the coating to go on a little smoother? I found my batch a little thick and although they turned out delicious they look no where near as perfect as yours! Put a little shortening in with the chocolate when melting...helps thin it out a bit. Yummy! I'm making these for a cookie swap next month. Thanks for sharing! You are killing me with all these cake batter desserts! YUMMO! Can you make these a few days in advance? Yummy! I can't wait to try these! I liked them, but the coating wasn't my favorite. I've had better truffles. @Little Love: If you add a small amount of shortening (1/4 teaspoon to 1/2 teaspoon) when you are melting your chocolate, it thins is out so it goes on a lot smoother. I have used a little oil in place of it for my coatings, but the shortening works the best (and it is such a small amount no one should panic about you using it). Thinking of making these into a chocolate mint type, would this recipe work with chocolate cake mix? I made these last night and about 20 minutes after they were all dipped, they started to 'explode'....it was like the heat from the chocolate coating was cooking the batter inside and the bottoms popped on some, some truffles had the batter squeeze out the side- almost like a tube of toothpaste. I don't know what I did wrong!! I have made these before, but my recipe is slightly easier: bake a cake as normal then crumble it up and add a jar of cake icing, mix well then form rounded teaspoonful balls. let cool, then dip into chocolate/almond bark! yummy! Can these be frozen? They look great, and I want to make them for a brunch, but I am short on time and would like to make them ahead of time and freeze if that is possible! i just tried making cake batter truffles form another blog and they were super messy and not quite so simple so i think i will try these and hopefully ill have a better outcome! Like Kristin said, I want to know if these would be ok to freeze. I'm wanting to make them for a Christmas party but I want to try them a few days before to see if we like them. Can they be frozen and still taste great? These were way too sweet for me. It was the icing that was over the top. But they look really cute at least! I used the Christmas sprinkles! Wow - these were really easy and turned out great! Super rich, but soooo yummy! I tried these and they were yummy! @Joy, Mine started to explode too! Any thoughts on how to keep this from happening? what is almond bark, exactly? These were relatively simple and easy to make! Tasty, too! Going to try this today!! Thanks for the receipe! I'm making these today to give as Christmas gifts to friends, teachers and neighbors. Thanks for sharing the recipe! I have a trick for making the almond bark easier to work with - add a little crisco. Also, reheat the bark after a while, when it gets a little thick.To answer someone's question - almond bark is found in the baking aisle of your grocery store. Sometimes referred to as candy coating.to answer another question, I have never frozen the balls once they have been dipped, but I have kept the unfrozen balls in the freezer for a while to "have on hand" and then just dipped the day of the event and they were great. I have NEVER made anything except reservations for dinner but I saw the recipe for the Oreo truffles and thought...even I can't mess this up (hopefully). I made them last weekend for a friend's party and they were a complete hit! I was completely astonished that I could make something people actually liked! I am going to make something else this week with my new found confidence. Wish me luck...this may be a new beginning for me!! These sound yummy! Can't wait to try them. Yep, definitely going to have to try these. Made these twice now in this holiday season. Everybody that has tried them, loves them and wants the recipe. Taste yummy! Thanks for a great recipe. I made these for Christmas. They were eaten quickly and everybody raved about them. Thanks for a great recipe! I'm confused-I used the powered cake mix? I don't need to bake the cake first? How does it become the "cake like consistency?" as shown in the picture??? I want to make these but I think I'm confused! LOL Only I could screw up something "no bake..."
Found this recipe this morning and made it this afternoon! AMAZING! and super easy :) i think i want to try it with cherry chip cake! its my favorite and i think it would turn out wonderfully. I made these with my daughter last night - they are great! I've been keeping a look out for a recipe to redeem some really low-quality store brand cake mix I've had in the pantry for some time, and these had enough other ingredients that they covered up the cardboardiness of the batter mix. I'm sure they will be even more amazing when I make them with good mix! Also, we didn't have white chocolate so I used semi-sweet chocolate chips, and was too lazy to dip so i just spooned chocolate 'hats' on top of the balls of batter. They still look cute and it tastes really good with the chocolate :-) Impressed! Thanks! O - for the person asking about the cake mix vs. cake consistency, because there are so many dry ingredients, they are very dense. They aren't quite 'cake like consistency' but they do come out just fine, and the insides look like the picture, even though nothing is baked! Do you think these would ship well? They sound fun for sending to my brother overseas. I made these with pink cake mix and wrote about them here. I think they are my daughter's new favorite cookie. Thank you for sharing the recipe! Made these tonight-- they were amazing! So so good. I thought they would be too sweet but they were just perfect. seriously the best things ever!!! LOL WHAT!?! A little sugar is fine. Relax. Hmmm...sugar is really bad for kids? Well sugar is not good for anyone when in excess. If you feed your family anything processed, they're getting a healthy dose of...you guessed it...SUGAR! So lighten up & please don't give your kids diet foods & drinks trying to avoid sugar because that is REALLY bad. Can't you tell sarcasm? She is only joking and saying that she wants them all! how long do they stay fresh for???? I just made these. They are awesome. Do these freeze well? I have to make 600 for a young adult retreat. We just made these! They are awesome! Thanks so much! Made these for the Super Bowl. They were gobbled up in minuted! Sooooooo delicious, Thank You soooooo much for sharing the recipe!! I had the same question but it is just the cake mix, not already mixed. At first before you add the milk it looks almost completely dry. However, Adding the 3-4 tbs of milk is perfect! you will see as soon as you start to roll them in your palms! Little hint to make them prettier: after rolling out the ball, put a toothpick in and freeze them for a couple hours. Makes them much easier to dip in the chocolate. Be sure to take the toothpick out before the chocolate sets or you will crack the coating. These were not only so good but they were very easy to make. I didn't find them overly sweet, though you should only eat 1 or 2 otherwise they are too rich. I used strawberry cake mix and added some extra red food dye. I also used water rather than milk. I dipped them in dark chocolate candy melts with a little shortening added and left out the cake mix from the coating. I keep mine warm with a double boiler so it was easy to dip.I can't wait to try more combinations! I was even asked to donate a few boxes for a fundraiser! just made these and didn't care for them. i think i prefer the cake balls over the truffles. i'll stick wth the oreo truffles....those were AMAZING!!!! Just tried it.. The dough was so sticky!! I had such a hard time making the balls out of the dough, it kept sticking to my hands. And once I dipped in the bark, they started to melt and deform and stick to the fork.. But overall they turned out looking pretty good. Hopefully they'll taste just as good, trying them tomorrow, giving them to my fiance as part of a valentine's day gift. These look delicious I am definetly going to try these and see how they turn out! Thank you for Another recipe to try!!!!!! I just made these this weekend and they turned out great! Super easy to make and really sweet tasting. Definitely a recipe to keep... thanks! I wasn't crazy about them... Baked cake balls are better in my opinion! I think that they were just a little too rich for me. I made these using a Strawberry Cake mix and dipped them in Vanilla Almond Bark. They were awesome but next time I would cut back a little on the flour (they kind of had a flour-ey taste to me, maybe due to the different cake mix) and sugar. They were VERY sweet, almost too much. It's a great recipe and I will try other flavors in the future. Also, my recipe made 34 balls (I used a small scoop so they were all the same size) and I only used 6 squares of bark to dip them and it was about perfect, only a little left over. These were so good but I need to work in my dipping technique since mine didn't look as good bit tasted great! have you ever mixed up a batch of cake batter and let it sit in the bowl for a few minutes? it expands because of the baking powder in the mix. i'd let your batter rest in the fridge before you shape it next time. that way it will expand before you shape it and dip it. Has anyone made them using Splenda. Sorry, list is too long to read. I just made these, and they are soooo good! Very sweet, but super delicious!! So I made these today and they were so easy and taste delicious! I will definitely be making them again! I have had people asking me to bring them some! I love this recipe! It was so easy, and so yummy. My daughter has taken over and makes them for school parties and such. Her friends love them as much as we do. I DO have a question, though. After you've made a batch, if you haven't used the entire box of cake mix, what do you do with it?!? I'd love to use it, but now that I've taken a cup or more out of the box, I have no idea how much oil/eggs/water/etc to add to it to make a successful something. Any ideas/suggestions? And I apologize if this question's been asked before. I did read through the comments but might have missed something. Oh my goodness! Those look so tasty! I loooooove sprinkles! So how close are these in flavor to the Starbucks Birthday Cake Pops? The ingredients for the Truffle Coating seem to be missing. And vanilla is listed twice in the instructions, but only once in the ingredients. Thank you so much for the recipe, I found it from Pinterest. I made these today & they are the best thing in the world. I LOVE sprinkles so I knew I had to try them! They are so sweet & yummy. I think they taste like a soft sugar cookie. So fabulous! I can't wait to get feedback on them tomorrow. I found the same problem here. You and I are the only comments with regards to that. I made these exactly to the recipe (I didn't even need the extra milk- they were a perfect consistency) and they were beautiful. Beautiful but not exactly how I expected them to taste. Don't get me wrong, I loved them and so did my gang of "taste testers" but I think I will be changing the recipe title to "Sugar Cookie Truffles" in my family. That's what we all agreed they tasted most like. Just made these and they were so easy! Great job, thank you! Found these on pinterest, and I have them setting up in the fridge now. I melted my chocolate in a double boiler, and it was a great consistency, but then I got a steam burn :( Hope these are as good as they look! These are delish! I've made these twice, but each time the chocolate coating has been an epic fail. The melted chocolate is almost impossible to work with, and they end up look like lumpy messes. Any tips? I just tested these out tonight... they are super good, but very rich!! My only problem came with the coating... any tips more on dipping them, every time I try something like this they look like crap and are really hard to coat... I ended up just flattening the balls and topping them with the almond bark... advise? I add some shortening to mine to thin up the chocolate. I dip mine with a spoon roll it around and then scoop the ball out of the pot with a fork and gently tap the fork on the edge of the pan so the extra chocolate runs down and back into the pan. I hope that makes sense! :) Good luck! I know I'm about a year too late on these - but I'm going to make these tonight! So excited! Made two batches of these for our Thanksgiving Potluck tonight at work...only I did a milk chocolate coating instead of almond bark. I made the first according to the recipe, but it tasted like generic cookie dough instead of cake batter, so for the second batch I did 1.5 cups of cake mix and 1 cup flour instead and it came out with a much stronger cake batter taste. Can't wait to bring them into the ER tonight! these look and sound AMAZING! can you use any boxed cake batter? For example, red velvet? I am a bit confused but used some common sence to proceed and hope it comes out right. in the directions you way to add vanilla after the sugar and butter (which is where you would usually add it) but then again after all the dry ingredents are added. one would assume this is a typo but what would I be using rather than that vanilla after the dry ingredents or do i just disreguard that part of the instructions all together? Do you have a recommendation as to how to make this with more of a milk chocolate taste? Would you just use chocolate almond bark instead of white chocolate almond bark? You missed the almost bark in your ingredient list. These were so delicious and so fun to make! I can't wait to make them again! Does anyone know what she means in the instructions by almond bark..? The list of ingredients call for 16 oz. white dipping chocolate. The directions say "almond bark." Which is it? These are amazing! I veganized this recipe by using earth balance instead of butter, ground up turbinado sugar instead of granulated sugar, and coconut milk to make it a dough like consistency. It's easy enough to find vegan cake mixes too. They turned out amazingly and I would definitely make these again! Y'all, these ARE deish! They sale these....several different flavors.....at Buc-ees, for those of you who have ever been to a Buc-ees in Texas! And they are $1..99 EACH!! I am SO glad to get this recipe! Hi, is almond bark the chocolate? can you do this with chocolate cake mix instead? How long will these keep in the fridge? can you freeze them before you dip them in the white chocolate then dip them when ready to serve? Need them for a wedding, but want to make a bunch about 2 weeks in advance? I've never heard of having trouble with eating raw flour. I realize it is pretty self explanatory for anyone who bakes. However, you have made a mistake in the directions. For #1, you have left out the sugar to blend with the butter. I just made these and they are delicious. Instead of using a yellow cake mix I used a confetti cake mix. this way no sprinkles necessary. I used instead of milk, Vanilla coffee cream. The recipe calls for 3Tbsp of milk but I needed to put in 7 Tbsp of the cream,,this made the perfect consistency. I used dark chocolate and drizzled white chocolate on top. I also rolled the dough around cherries,,I have to say,,YUMMY! These were good, but extremely way too sweet. My teeth hurt as soon as I bit into it and that's never happened before. I'm going to try to cut the amount of sugar in 1/2 or even more next time. You toast the flour to avoid that risk. Low oven setting does the trick. I'd love to make this recipe, but I need clarification on "ALMOND BARK, AND WHITE DIPPING CHOCOLATE" Are they one in the same? Almond bark is not in the list of ingredients, and white dipping chocolate isn't in the directions. .......... Then, I'd like to comment on the "health" issues that are posted here. This is a sight for recipes and I believe it is not a place to discuss what is good or bad for you. As politics and religion are inappropriate to discuss outside of the appropriate settings, so is sugar being good or bad for you. The intake of sugar, as with everything else, is an individual choice. It is not poison, it's food. Some people are allergic to flour, or gluten sensitive. I didn't see anyone talking about the effects of flour or gluten. IT'S A RECIPE LADIES, not a health class!! Take your health issues and arguments to the appropriate arena. Since truffles are a candy it would make sense that they are quite sweet. These little beauties look more like Petit-Fours than truffles, especially since they are cake-like . This recipe for truffles lists "dipping white chocolate" and within the instructions it advises to melt :almond bark"- which do you use? What can i use in place of the yellow cake mix? I am from South Africa and we dnt have that here or that i know of! Did you end up making these and replacing the yellow cake mix? I am having the same issue now and want to make these! Hi! I made these and they were delicious. The only problem is about 24 hours after making them, they started "exploding" - the coating cracked and the filling started puffing out. Almost like the cake batter was cooking and expanding?? I let the batter come to room temp before dipping so I know it wasn't from them being too cold. Please help!! Hi! I want to make these so badly but I am somewhere where yellow cake mix does not exist! What can i use to replace it? This recipe is easy and tastes very good. hi so i am not saying that unbaked flour is not bad for , but sometimes people find it ok , because they limit how much they eat each day it is not a bad idea so i learnt that u have to try new things. maybe u normally eat cakes that are fully baked but some people want to try new things i am not saying u need to try but u should try new things. We did not care for these at all. The taste of uncooked flour is not good. I've tried the no bake Oreos and those are yummy. We made these for the bakery I work at and we all agreed the uncooked flour taste was not good. Freezing is as effective as boiling in killing most anything that could be in flour. So if you have any fears of bugs of any kind, just freeze it and it should take care of any issues. I tried these today- meh. Vanilla flavor alone was flat - not interesting if you follow the recipe. Texture is nice though. I added orange zest to the filling and coated them in orange -infused confectioner sugar instead of the white chocolate ( what was the thing about almond bark?) White chocolate for a coating was sickeningly sweet. Deleted the sprinkles all together. Better. Would be fun to do with kids! Wonderful idea but the raw flour taste is very strong! Once you get past that, these are wonderful! Its a candy coating found in the baking aisle of most grocery stores. I hope that helps! Indeed, whoever told you not to use raw wheat or all purpose flour was right.....however, it can always be replaced with the almond flour and I made these using almond flour and it turned out to be my favorite truffles so far ! Couldn't you use almond flour instead of regular flour? these are delicious! making them again, they are way easier than cakeballs, and even taste better!